So Susan LaHoda, Executive Director of the Imagine! Foundation, has taken it upon herself to write up a couple of stories of folks who have stories that simply cannot be ignored. In that spirit, please enjoy the story below about Bob Charles, the Founder of the Imagine! Foundation and truly one of Imagine!’s most generous supporters. 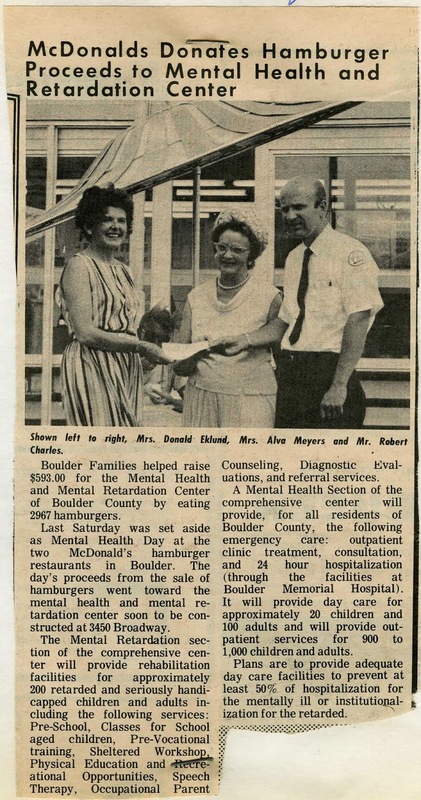 This newspaper article from the 1960s demonstrates that Bob Charles has been dedicated to supporting individuals with developmental disabilities for quite some time. When asked to take the leadership role in establishing the Foundation, Bob was technically “retired” from owning and operating 13 McDonald’s Restaurants in the area, although he was still very active as a volunteer on several non-profit and educational boards and committees. But Bob says, “My heart had already been softened to the idea of helping individuals with developmental disabilities because I had hired several for my restaurants, and I was intrigued with how well they worked.” So he agreed to launch the Imagine! 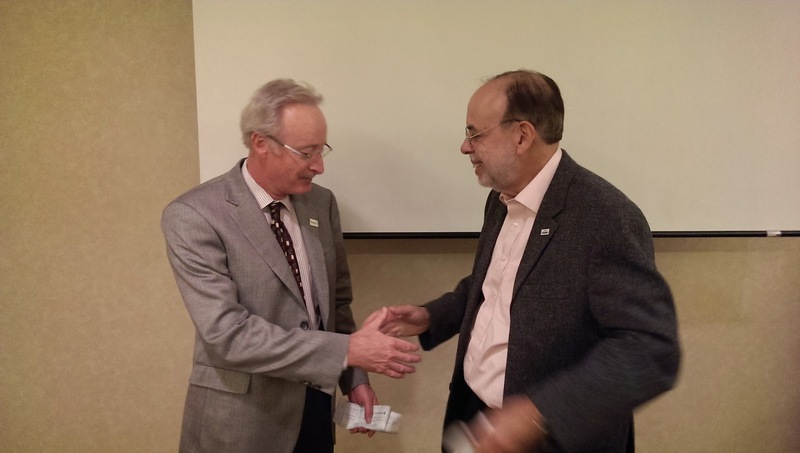 Foundation and, because of the enormous respect he commands in the community, was able to put together a highly qualified and influential board of directors who joined primarily because they had tremendous admiration for Bob and his reputation for generosity, honesty, and commitment. Bob served for three years as the Foundation’s president, guiding and encouraging the fledgling organization all along the way. During that time, the Foundation was able to raise funds for the purchasing and paying down a significant part of the mortgages on five staffed homes for Imagine! clients. It wasn’t long before Imagine! asked the Foundation if it would help raise funds for two SmartHomes that would serve as laboratories for testing technology to promote client self-sufficiency and improve staff efficiency. At this point, Bob was far past the two three-year terms of service offered in the Imagine! Foundation’s by-laws and was given Emeritus status, but remained as active as ever. He spearheaded the capital campaigns for the two SmartHomes, but, more than that, he and his wife Judy provided the naming gift for the Bob and Judy Charles SmartHome in Boulder, and he and his family, including sons Bob, Jr. and Dale and daughter Janice, provided the naming gift for the Charles Family SmartHome in Longmont. Bob is very involved in the SmartHomes and keeps up with the technologies that are being tested there and the progress of individual residents (even offering challenges to some to learn new skills!). There is no real way to adequately express our appreciation, Bob, for the difference you have made in the lives of those we serve. On behalf of all of the Imagine! community, we extend our deepest thanks. “50 Stories, 50 Years” bonus video – Bob Charles speaks at the grand opening of the Charles Family SmartHome in Longmont, discussing the origins of the Imagine! Foundation and why the work Imagine! does is so important. “50 Stories, 50 Years” bonus video #2 – a video honoring Bob and Judy Charles as Imagine!’s 2008 Donors of the Year. Two short pieces of good news to share today. First of all, Imagine!’s crowdfunding campaign for flood relief came to a conclusion last Friday, and we are very pleased with the results. We raised $18,197, 91% of our ambitious goal of $20,000. This total doesn’t include grants from the St. Vrain Flooding Relief ($10,000) and the ANCOR Foundation ($6,000). Thanks to all of you who donated or shared the campaign with your friends and family – we couldn’t have done it without you! Second, the video below has been all over social media this week. It features Alonzo Clemons, who receives services from Imagine!. I have written about him before, but what makes this video really stand out about is that it features Alonzo’s story in his own words. Enjoy! This week’s contributor to “50 Years, 50 Stories,” Stephanie Tilley, is a true renaissance woman. In addition to being a ten-year veteran of Imagine!, she is a published author and a talented softball player (she does the Imagine! softball team proud). She has also recently undertaken a new task as part of her duties at Imagine! – a feature on our Imagine! 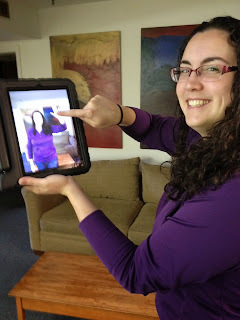 SmartHomes blog called “Stephanie’s High Five” where she shares five apps for tablets and mobile devices that may benefit individuals with a variety of intellectual and developmental disabilities. Thanks for sharing your story, Stephanie! Stephanie Tilley gives herself a high five. I came to Colorado in January of 2003. I needed to complete an internship in Therapeutic Recreation to complete my bachelor’s degree at the University of Georgia. 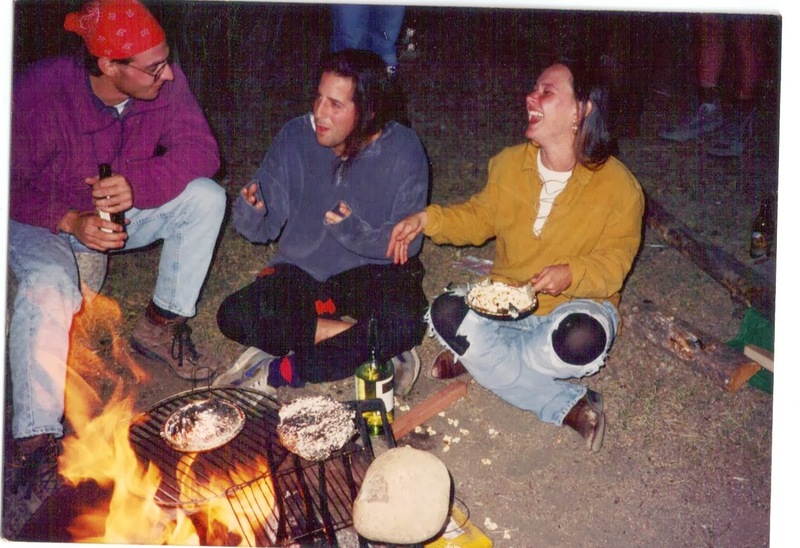 I wanted to intern at a place that did community-based Therapeutic Recreation instead of clinical based. There are very few places in the United States that do what Imagine! does. I should know -- I looked! So I packed my car and drove 24 hours from Georgia to Colorado to work at Out & About. I worked with the kids on some days and the adults on others and also got to work some of the weekend activities. I had all intentions of completing my internship and heading back home to Georgia, but , once I was here, I almost immediately fell in love with Colorado and Out & About. Working with the participants and staff was so rewarding, and every day was an adventure! We were supporting participants in accessing and contributing to their communities in a way that I had not seen or heard of anywhere else. Participants were thriving in the community, learning new skills, and trying things that they and their families had doubted that they would ever be able to do. We were always encouraged to think outside the box and come up with creative solutions to challenges that we encountered along the way. I always said that my job was twofold…teaching and supporting the participants in the community and teaching and supporting the community in the process. During my internship I was privileged to get to shadow some of the Occupational Therapists in Dayspring for a day and also visit one of the work sites with a Labor Source crew. I learned about the different departments at Imagine!, and I was amazed at how the different departments worked together and each added a different aspect of support to the participants and their families. After my internship was done, I didn’t want to leave. Colette Marie, Coordinator of Out & About, offered me a job, and after a short time back home to fulfill a previous summer commitment, I started work on September 1st, 2003. Because of support from Colette and Out & About, I was able to complete my internship, sit for the national exam, and gain my certification, becoming a Certified Therapeutic Recreation Specialist. During my time at Out & About I learned how to write individual plans, how to plan outings in the community, and how to adapt. Not only did I learn how to adapt the activities, but I learned to adapt myself. I learned how to become more patient, more flexible, and more understanding. I had to throw most of my assumptions out the window. I learned not only about the physical barriers that our participants encountered, but also about the social and emotional unseen barriers that they encounter as well. Imagine! as a whole combats the barriers put on our participants every day, and for that I am proud to be a part of such a wonderful organization. I have been blessed to work at Imagine! for 10 years! I have learned even more about the different departments at Imagine! and have met so many wonderful people, especially on the Imagine! softball team. I was inspired to write a book called “101 Adapted Games for Kids,” which provides adaptations for children’s activities to create inclusive activities and environments. I worked eight and one-half years at Out & About, and this last year and a half have been with CORE/Labor Source. My work at CORE/Labor Source with adaptive technology and the IT department at Imagine! continues to solidify my faith and joy in how Imagine! departments work together to adapt environments and support our participants to thrive. I hope there are many more years to come, as I am truly thankful to work at Imagine!. Most people I know today never had the rich experience of hitchhiking. I truly feel a sense of loss for them. Hitchhiking successfully is truly an art. In my experience, the art of hitchhiking included: setting an intention (often times a destination) within a general timeframe. The experienced and successful hitchhiker knows best locations or points of likely success; touch points where he or she would more likely score a ride. But even with planning and knowledge, the experienced hitchhiker must be prepared for change. Surprises happen when you put yourself out there and make your intention known. The person standing next to you may be headed the same way. The journey could be three hours or eight hours. You had to deal with unknowns like the weather. Control often switched between rider and driver. Having an exit strategy might help, but never was a requirement. It diminished the adventure. In my case, I had tactics. I used a multi-fold sign to communicate a milestone or my intention: CONCORD, NORTH, HOME, UNH. This often created a connection with the driver. When I reverted to using HOME, it was clearly creating an emotional connection. Milestones, intention, direction, destination, and emotion. Hitch hiking is not punching a clock. I didn't mean to digress about hitch hiking. I meant to talk about Strategic Planning. Start by setting an intention ... write it down ... establish direction ... communicate with others ... recognize milestones ... motivate with emotion ... consider exit strategies ... understand you will not be in control of the complete environment ... people may surprise you by helping you meet your intention. Huh ... sounds a lot like hitchhiking. I have always appreciated living and working where I do. I think that we are a truly exceptional community. In the aftermath of the recent flooding in our area, the esteem I hold for my community has grown even more. Today I’d like to share a few of the many ways that organizations big and small have reached out to support Imagine! as we work to recover from the disaster. Big thanks to the Olive Garden restaurant in Boulder. They contacted us last week to provide a lunch or dinner to some Imagine! folks who have suffered during the flood. Last Thursday they treated Cari Pounds (on the left in photo), who is served by Imagine!, and Direct Care Professional Kristin Conboy (on the right) to a lovely dinner. Kristin and Cari live in Imagine!’s Tenino home, which was damaged by the floods. In addition to the flood damage, Tenino is having its kitchen remodeled (bad timing for sure) so the Olive Garden also donated 12 complete microwavable meals for the next six days! Two weeks ago, Fred Erlich, CEO of Albany, New York-based Living Resources (on the right in the picture above) presented me with checks totaling $1,200 to help Imagine! rebuild homes damaged by the recent flooding. The checks were collected from Living Resources staff members, and Fred was out in Colorado to attend a Technology Best Practices Provider meeting hosted by Imagine!, as well as the Coleman Institute for Cognitive Disabilities’ Annual National Conference. I offer my sincere gratitude to our New York friends and partners in using technology to improve the lives of individuals with a variety of disabilities. I’d also like to offer a hearty “thank you” to the St. Vrain Flooding Relief Fund for providing Imagine! with a $10,000 grant to help Imagine! cover some of the extraordinary costs incurred during the flooding in our area last month. The St. Vrain Flooding Relief Fund was established by the Longmont Community Foundation to provide financial resources to charitable organizations that are involved in the relief and rebuilding efforts in the St. Vrain Valley related to the September 2013 flood. Imagine! 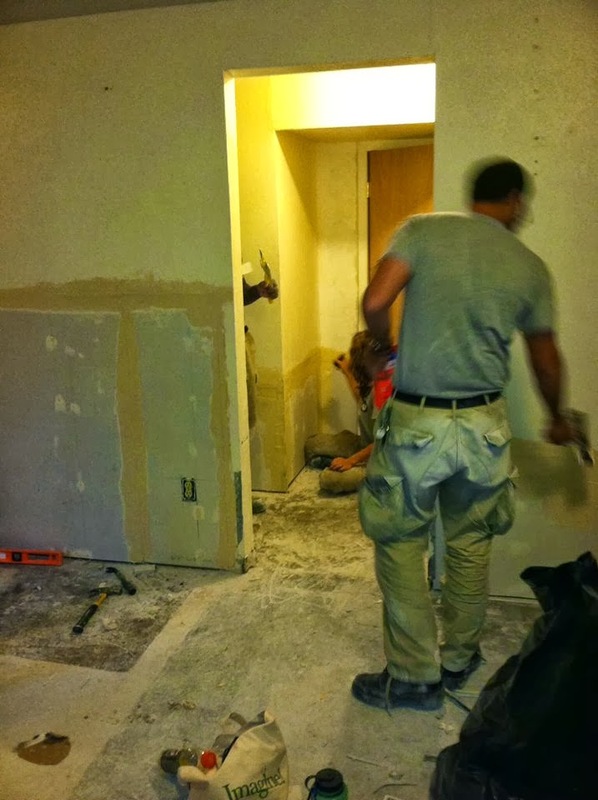 will use the grant to help pay for flooring, drywall, and paint for our Garden Place home. Thank you for helping us to recover! The ANCOR Foundation has provided us with a grant of $6,000 for flood relief. The ANCOR Foundation is dedicated to expanding the commitment and capacity of providers and communities dedicated to improving the quality of life for people with disabilities. We are longtime and proud members of ANCOR (The American Network of Community Options and Resources) and are so pleased that they are helping to support us in our time of need. 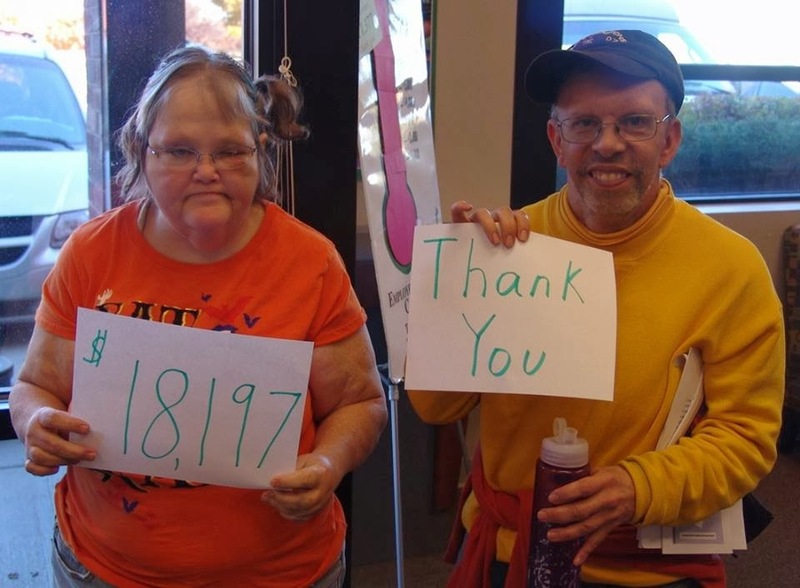 Many thanks are in order for the good people at Inspiration Field, which serves approximately 200 children and adults with developmental disabilities in the Colorado tri-county area of Otero, Bent, and Crowley Counties. When they heard about the floods and the impact on folks served by Imagine!, staff members and clients jumped into action, collecting items including gently used, and new, clothing items that ranged from underwear to winter coats to pants to towels, several boxes of toiletries, new hoodies, shirts, goodie bags from Inspiration Field, and $300 in gift cards. The pictures below show the items, and the first one shows Inspiration Field CEO Johnnie DeLeon, who drove all the way up from La Junta to deliver the goods. Thanks to all at Inspiration Field, you truly inspire us! This past Wednesday evening, total of $2,262 was raised at a bingo night hosted by the Denver Metro Young Republicans, the Colorado Hispanic Republicans, and the Rocky Mountain Energy Forum. This fundraiser for Imagine! flood relief was held at Jackson’s Restaurant in Denver. The first $387 was contributed by participants through rounds of bingo, and then a surprise guest, former U. S. Congressman Tom Tancredo (pictured below with Imagine! Foundation Executive Director Susan LaHoda), presented a check for $1,875. A big thank you to all who participated and donated! And here’s one of my favorites. Members of the student council at Fall River Elementary School in Longmont are organizing a change drive at the end of this month (October 21-November 1) to help raise money for Imagine! flood relief. What a bunch of cool kids! Thanks! If any of these stories above inspired you, there’s still time for you to help! Today is the last day of our flood relief crowdfunding campaign, which ends at midnight. 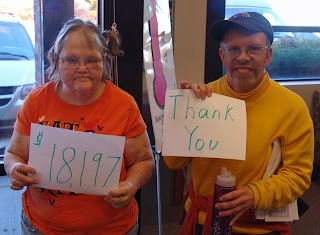 As I write this post, we are currently at $17,527 or 88% of our goal of $20,000. Thanks to those of you who have contributed personally and those who have passed along the link to the site. We’d love to reach our goal, so we’d very much appreciate it if you would continue to spread the word!! Or, if you’d like to make a donation, click here. Every little bit helps! Lately I have been pondering a challenge that many of us in the human services field face: how can you create an organizational environment that allows the organization to thrive where many of the jobs are difficult (mentally and physically) and competitive wages are a challenge? My ponderings have led me to research what other organizations in this situation have done, and two main philosophies seem to have emerged. One philosophy is to view the organization as a family, and employees as family members. This philosophy has many positive attributes. When employees feel they are part of a work “family,” they establish family-like relationships where family members care for one another. This is important and in smaller settings can produce results. They may feel protected by the organization and exhibit a strong sense of trust in the organization. 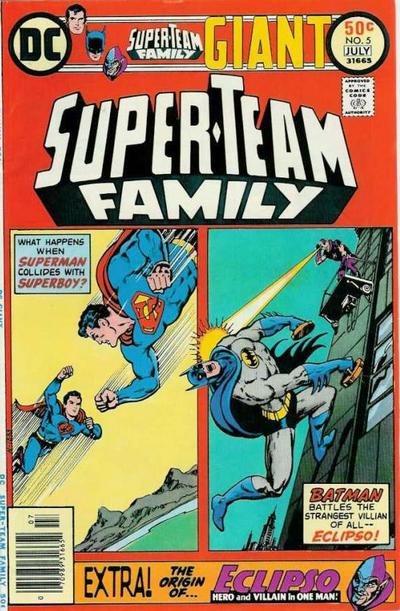 But I think there is one major drawback to having an organization be like a family. In a family, love is unconditional. You are going to love your son or daughter even when he or she crashes your car on the way to school, hosts a party at your house when you are away for the weekend, or drops out of college after two years to play drums in a heavy metal band. In organizational terms, that unconditional love can mean that lesser performers are kept on board, and on the payroll, just because they are family. Family embraces what is available and accepts the status quo. Family members are not traded. There is much less accountability for poor performers. This of course begs the question, what happens to high performers? What does the future hold for them when it is a collective agreement for them to carry the load? Where does their motivation take them? For much of its 50-year history, I think Imagine! has been a family-like organization. And we’ve had amazing successes under that philosophy. However, I think it has lately been transitioning into something else, and I think it is a healthy and necessary transition. Changes in our system and funding shortfalls have demanded that we must be more accountable than ever before for our performance. 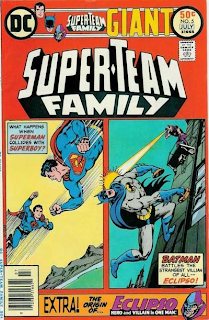 I would argue that we are becoming less like a family and more like the second organizational philosophy I came across in my research – a team culture. Like a family, a team creates a sense of mutual obligation, and inspires teammates to support, protect, and trust each other toward an end. However, a team is much more focused on performance. There is not a sense of unconditional love. Great performances in years past don’t necessarily mean that current poor performances are tolerated. Success is quantified and measured, and there are standards to meet. If a teammate can’t meet those standards, support is offered, but only to a certain point. We have made team-like adjustments at Imagine! that are less reflective of a family and more reflective of a team, such as establishing processes to measure and track performance, providing support for struggling performers, and recognizing all star performances. I don’t mind admitting that some of these changes have been met with a look of uncertainty, but I firmly believe that this transition to a team-oriented culture is vital for our organization. I think it creates an environment at Imagine! where employees can thrive, our organization can thrive, and most importantly, the individuals we serve can thrive. This week’s installment of “50 Years, 50 Stories” comes from Dr. Oliver Gerland, Director of Graduate Studies at the University of Colorado’s Department of Theater and Dance. For the past couple of years, Oliver has taken time out of his busy schedule to facilitate Out & About’s Centre Stage program. Below, Dr. Gerland shares how the participants in Centre Stage create all aspects of their own theater production. Very enjoyable reading. My association with Imagine! goes back awhile. When my daughter was younger, she received services through Imagine!’s Out & About program, and we were very pleased with the services and with our daughter’s experience. So when an email came through my inbox a couple of years ago from the chair of my department saying that Imagine!’s Out & About program was looking for someone to head up its “Centre Stage” classes for adults with developmental disabilities, I jumped at the opportunity. For example, here’s how the 2012 production came about. In an early class, I did an exercise where I asked each participant to pretend he or she had a piece of clay, and asked them to do whatever they wanted with the pretend clay. One participant turned the “clay” into pizza dough, and began rolling it and tossing it. His actions and movements were so real and so vivid, it seemed like he really did have a roll of pizza dough. So we decided that the play would be set in a pizza joint. At that point, we had enough of a framework for me to draft an outline of the play. I didn’t provide a script with the outline, however. Instead, I would set the scene for the participants and ask them what they thought they would say in that particular situation, and then let them improvise the lines. Eventually, those improvised lines turned into a finished script. With the script in place, participants began working on staging and costuming, and before long, the production was ready for live performances. Throughout the process, the participants led the way in bringing to life a play that was authentically theirs. My role was simply to facilitate their creativity. And the creativity was overflowing! Facilitating the Centre Stage class these past two years has been incredibly rewarding. When I watch the performances coming together, and when I watch the play live, I get the feeling that I am participating in joy in action. And as a theater lover, I can honestly say that the Centre Stage performances provide some of the best theater of the year in our community. It isn’t just the participants who have a blast. Audience members have a great time as well, and the energy during the performances is palpable. Sadly, increased duties at CU have meant that I won’t be able to lead the Centre Stage classes this year. But I will hold those memories forever, and hope to be back soon! Here’s a cool story about a positive that has occurred in the aftermath of the flooding that damaged some of Imagine!’s homes. 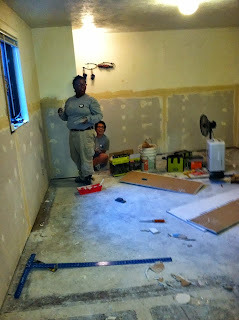 A group of ten AmeriCorps team members has come out to Colorado to help Imagine! fix its flooded facilities. The team came here directly after having helped clean up after Hurricane Sandy, so the members bring with them a great deal of experience in assisting others recovering after a disaster. They will be with us for approximately six weeks. They are bunking in one of our conference rooms during their stay. Imagine! staff members have been coordinating to provide the AmeriCorps folks with some home cooked meals while they are here. I want to personally thank each AmeriCorp team member. Their contribution toward helping us recover from the disaster is so valuable and much appreciated. Front row from left: Mayo Campos, Tyrell Moore, Natalie Hillmann, and Stephen Silber. Back row from left: Denasia Avery, Alyse Kearns, Liz Griffin, Adriana Bayona, Kiara Gales, and Ryan Abdelnour. And here are a couple of photos of the team in action. Imagine! employees who have visited Imagine!’s business office on a Tuesday morning over the past decade will recognize this week’s contributor to our “50 Years, 50 Stories” series. Dawn Dieffenbaugh, who receives services from Imagine!, has also worked for Imagine! for more than 11 years. Enjoy her story below, and thanks for sharing, Dawn! Dawn Dieffenbaugh shows her batting stance as she warms up for a softball game. I came to Imagine! when I was a kid. My mother was the one who started me out here. When I became an adult, I started working for Imagine! in the business office. I work as a file clerk, putting documents away and creating new files. I have been working at Imagine! for 11 ½ years! I have another job, too. I work at the National Oceanic and Atmospheric Administration (NOAA). I have worked there since 2009. In my free time, I love to play softball. I play for a team in Longmont (where I live) called “The Subway Sluggers.” I also like hanging out with my fiancé and hanging out with my two best friends (who just got married). Some of my favorite things to do are play video games and watch movies. I take classes in Imagine!’s CORE/Labor Source program, and right now I am taking a French class that I really enjoy. I like to work and go to these classes because it gets me out of the house. I’d go stir crazy if I didn’t stay so busy. I love Imagine!. The people here are so friendly and willing to help out anyway they can. About a year and a half ago, my mother passed away, and many people at Imagine! helped me out in planning her service. It was a blessing. Last week was a big week for technology in the world of supports and services for individuals with intellectual and developmental disabilities. 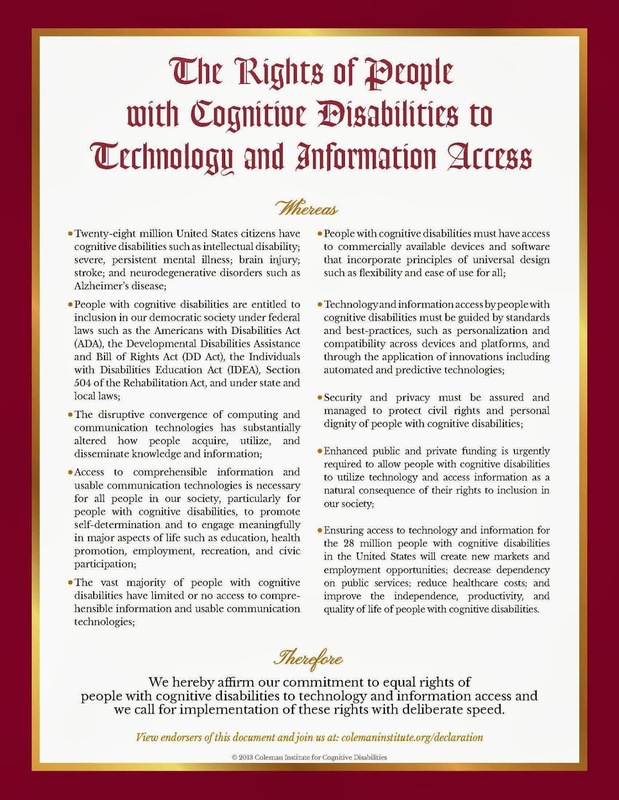 On Wednesday, October 2, The Coleman Institute for Cognitive Disabilities hosted its 13th Annual National Conference, highlighted by the official unveiling of a Declaration of Rights of People with Cognitive Disabilities to Technology and Information Access. If you haven’t done so, please click on this link and endorse that declaration. The day after the Coleman Conference, the American Network of Community Options and Resources hosted its annual Technology Summit and Showcase. For me, the highlight of the ANCOR event was the final breakout session of the day, entitled “The Ethics of Remote Monitoring” and hosted by Amy Hewitt, PhD, Director, Research and Training Center on Community Living, University of Minnesota, and Sandy Henry, Senior Director, Sengistix. The description of the session stated the intent of the discussion was to: review service changes over time and implications for the use of technology; discuss ethical considerations from the family perspective and in comparison to the DSP Code of Ethics; and look at rights, responsibilities and risks comparing on-site DSP support and remote monitoring. Despite the session being at the end of two days of conferencing, where even the most enthusiastic attendee can start getting a bit fatigued, the discussion that ensued during this session was lively. Although I hadn’t intended to, I eventually jumped into the discussion to make three main points about remote monitoring. (SPOILER ALERT: I’m all for it). Some session participants expressed mistrust in what potentially could happen with the remote video feed. Could an inappropriate video or photo end up on YouTube or Facebook? Well, the short answer to that is yes, it could happen. But I would argue that risk already exists using a more traditional model of supervision involving an employee being on premises, as opposed to monitoring remotely. I can say without hesitation that the majority of folks currently working those types of jobs have smart phones that they could easily use to take inappropriate videos or photos and share them. We trust the employees working face to face with clients to do the right thing, so why would that be any different for remote monitoring? The risk for either situation is the same. Another point was set forth that parents were concerned about companionship for their children who have developmental disabilities. Much of that companionship came in the form of paid staff members who provided services to the individual, and there was a risk that that companionship would be lost in a move to remote monitoring systems. I would respond by saying that we don’t actually know that to be true. In fact, using remote monitoring might free up more possibilities to explore natural support options, resulting in more friendships and companionships that are based on genuine mutual affection as opposed to a paid person who is obligated to spend time with the individual. 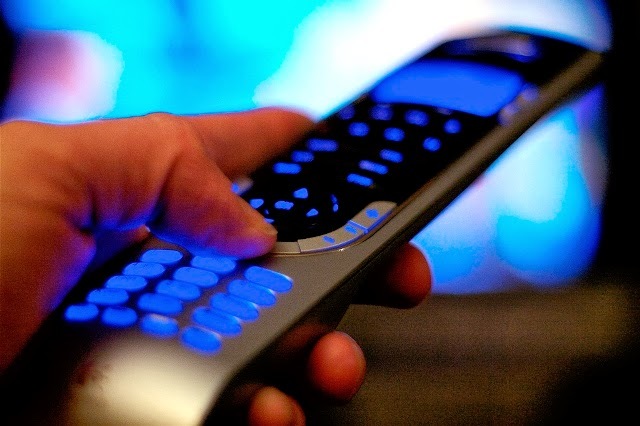 We won’t know until we give remote monitoring a shot. Finally, I put forth an argument that much of our debate on the subject will soon be rendered moot. The agencies and organizations that regulate the field of serving individuals with developmental disabilities have all sorts of regulations designed to keep the individuals served safe – things like mandatory smoke alarms or sprinkler systems. Mark my words – once these regulatory bodies catch up with technology, remote monitoring will become mandatory for safety reasons. Then these questions about the ethics of remote monitoring won’t matter, as we will all be obligated to use these systems. While the conversation about the ethical implications of remote monitoring was fascinating, I actually think it came a little too late. Remote monitoring will be used in the not too distant future, and now is the time for providers to accept that fact and figure out how to use the tools in the safest and most efficient ways possible. Ignoring remote monitoring, or fighting its implementation, will only become more difficult and time consuming moving forward. For almost five years, students in University of Colorado Professor Melinda Piket-May's freshman engineering classes have been creating assistive technology projects for individuals served by Imagine!. I have written about it frequently (like here and here and here and here). The projects have been great for Imagine! and the people we serve, and they have also served as an eye opening experience for the students. The video below has the students sharing, in their own words, what they projects have meant to them. I encourage you to watch the video through to the end to hear the story of one student in particular who was so moved by the experience he first volunteered at Imagine!, and then spent this past summer as a paid employee at Imagine!’s Out & About Summer Camp. Yesterday, I had the pleasure of participating in the Thirteenth Annual Coleman Institute National Conference on Cognitive Disability and Technology. The highlight of this event was the official unveiling of a Declaration on the Rights of People with Cognitive Disabilities to Technology and Information Access. The declaration is a statement of principles: the rights of ALL people to inclusion and choice in relation to technology and information access. You can see the declaration below (click on the image to enlarge it), or you can view the declaration and read more about its formation by clicking here. I believe this is a momentous time in the history of serving individuals with one or more cognitive disabilities. Technology is creating opportunities for community participation and enhanced quality of life in ways unthinkable just a few short years ago. But if the folks we serve can’t access this technology, those opportunities won’t add up to much. That is why this declaration is so important. So today, I am challenging all of my blog readers to endorse this declaration. 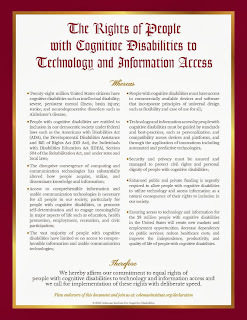 Let the world know that the community of individuals with intellectual and developmental disabilities and the organizations and caregivers who serve them are united in the belief that all individuals have a right to access comprehensible information and usable communication technologies to promote self-determination and engage meaningfully in major aspects of life. Go here to endorse The Declaration. Go here to read a Linguistically Accessible Version of The Declaration, as provided by The Arc. Go here to read Frequently Asked Questions about The Declaration. Today’s installment of “50 Years, 50 Stories” comes from Scarlett Joy. This entry has it all – humor, a little bit of sadness, and a great story that demonstrates the very real interconnectedness and the mutually beneficial nature inherent in the relationships between Imagine! employees and the people they serve. at a Labor Source camping retreat in September 1993. I'm fairly late throwing my hat into the ring of Imagine! stories, mostly because, as a result of six and a half years at Imagine!, the “memory well” runs deep and true with fellow (then DDC) staff and clients alike. In essence, it was hard to pick just one story. I walked onto the scene in 1991 considerably wet behind the ears, and, although I had originally applied as a residential counselor, I was easily swayed by Labor Source Regional Coordinator Gary Stebick to give their supported employment/community integration apprenticeship the good ol’ post-college try. This was a rather new and very innovative training program for Labor Source and an example of the WAY ahead-of-the-curve thinking that Imagine! is famous for. The story I’m sharing today surfaced about halfway through my Labor Source career. At the time, I felt reasonably comfortable in my newish role as a Regional Coordinator, yet still enraptured by what I witnessed on a near-daily basis: the pinnacles, the challenges, and the triumphs for both clients and staff alike. In short: we all experienced amazing days, okay days, and, once in a while, very bad days. One such “very bad” day began the morning we heard the devastating news that a beloved co-worker had died in a kayaking accident the evening before. As his supervisor and friend, I thought I had a pretty good idea about the impact this loss would have on the team. As expected, it was huge. And, although through the experience we rallied and our bonds grew stronger, what I soon came to realize was the impact Charlie’s absence would have on the clients. I’m going to go out on a non-existent limb and say that Charlie was favored by most if not all of the clients we worked with. One gentleman in particular – Greg – would often proclaim that Charlie was “The Man!” Charlie had a natural and breezy way with Greg that many of us admired. Greg proclaimed, visibly annoyed, “I KNOW THAT!” And he repeated this statement just to make sure we were all clear on that fact. As I recall, the staff kind of stood there confused for a minute or so, but, being late in the day and rather than over-think the situation, we instead decided to let it ride and see if it happened again. From that point forward until I left Labor Source (and Imagine!) in 1997, Greg called me “Charlie” in both private and in public. However, it’s equally important to acknowledge that he also referred to me as a “she” when he was talking about me both in and outside of my presence. That’s a far cry from being “The Man” – as Charlie certainly was. Here’s my personal take on the situation: I KNEW that Greg didn’t think I was actually Charlie. And I would hardly assume that I was Greg’s second favorite Labor Source staff member and was therefore defaulted the “Charlie” title. (Side note: if anyone was his next favorite, I’d vote it was Georgia). I interpreted Greg’s reassignment of my real name to Charlie’s as a means to express the feelings of friendship, respect, and the hard reality of deeply missing someone you can’t have back in this lifetime. I also saw it as an expression to hold onto the memory of Charlie in a way that was uniquely Greg’s. For all of these reasons mentioned, I was okay being a vehicle of sorts for this to happen. And notably, the fact remained that Greg still treated and responded to me as he always did – as Scarlett – just under the guise of a different name for his own personal set of reasons. This experience not only moved me deeply, it also validated the realness and impact of genuine human connection despite any actual or perceived limitations on a mental, emotional and/or physical scale. Of the countless (and I mean COUNTLESS) things I learned over the years at Imagine!, one of the most touching of them all was Greg showing me the importance of expanding my understanding and perception of two very powerful human traits: friendship and bonding. Thank you, Labor Source and Imagine! clients and comrades. You’ve served me well, and I’m forever grateful. Shine on as you do. I thought I’d take the time to give one more update about the floods that ravaged our area, and how it impacted Imagine! and those we serve. I don’t want to contribute to anyone’s flood fatigue, but I figured one final update was warranted, along with some initial analysis of what we learned during the experience. The best news of all is that despite the historic nature of this catastrophe, all of our employees and the individuals we serve are accounted for, and all are physically unharmed. Several lost homes and/or possessions, and their road to recovery will be slow. We at Imagine! are committed to doing what we can to support them during these difficult times. I must say that I am very pleased with Imagine!’s overall response to the crisis. I have already shared stories of the many employees who went above and beyond to ensure that everyone we served was safe. Those stories remind me of why Imagine! is such an extraordinary organization. But it wasn’t just that our employees were fantastic. I think this experience also demonstrated why planning and foresight matter, and I believe that happens to be something we excel at here at Imagine!. For example, we already had a disaster preparedness plan in place. Interestingly enough, the plan focused on the most likely disaster scenario we might face at Imagine!, which happened to be floods. Knowing that plan was in place, and seeing in hindsight how well we followed that plan, is very satisfying. We also had a crisis communication plan in place, which meant we were prepared when the crisis hit to keep the information flowing to all of our stakeholders. I think an especially effective aspect of our communication was our use of social media throughout the flooding. I’ve long argued that social media is an effective and inexpensive way for non-profits to communicate with stakeholders, and Imagine! had already established a strong presence in the social media world before the disaster struck. So it wasn’t surprising when the number of people viewing our social media sites skyrocketed during the floods. Our stakeholders knew that Imagine!’s social media outlets were great outlets to get the most updated information about what was happening, how we were handling the situation, and what was coming next. Over the past few years, Imagine! has moved more and more of its administrative functions to cloud-based computing. This also proved helpful during the flooding, putting us in a position to keep moving forward despite the devastation around us. We didn’t have to worry about losing data, or employees losing access to important documents or software programs that allowed them to do their jobs. Even if we sustained damage to our administrative offices (which thankfully we didn’t), due to our moving to cloud-based solutions, we still would have been in a good position to continue operating as normally as possible under the circumstances. Speaking of which, I am so proud of the way employees have quickly returned to normal. We haven’t allowed the epic floods to stop providing services, or even to slow us down in any substantial way. If you came to our offices or work sites three weeks ago, and then came to our offices or work sites today, you wouldn’t see much difference. We have “returned to normalcy,” as Warren Harding might say, and I think that is a great thing. I’m not saying our response was 100% perfect. Not everything went smoothly. And we still need a great deal of support to help pay for the costs of cleanup and repair. But overall, I believe the performance of Imagine! employees and Imagine! as an organization was stellar. A good measure of any organization like Imagine! 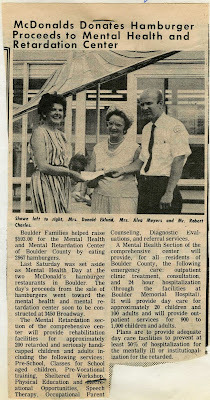 is its ability to provide care and comfort during times of crisis for the individuals it serves. We did that, and some more. Finally, I’d like to thank everyone who has supported Imagine! and those we serve during this crisis. Yes, we did well as an organization in responding and getting back on our feet quickly, but we couldn’t have done it so effectively without the generous outpouring of resources, both financial and physical labor, that we have received over these past two weeks. I am genuinely impressed by the way so many in our community, and beyond, have offered to help. It is most appreciated, and it won’t be forgotten.